Boomerang is another fact-based drama produced by Louis de Rochemont, the maker of the “March of Time” series of newsreels. Like de Rochemont’s other films, The House on 92nd Street (1945) and 13 Rue Madeleine (1947), it features stentorian, “newsreel”-style narration by Reed Hadley, a number of the actual participants in the case playing themselves in minor roles, and a commitment to verisimilitude that is less cut-and-dried than the filmmakers would have the audience believe. For my money, Boomerang (or Boomerang!, as it appears on the cover of a notebook in the opening credits) is far and away the best of the first three films de Rochemont produced. A great deal of that is due to the direction by Elia Kazan. Kazan was coming off the success of A Tree Grows in Brooklyn (1945), but he was still better known for his work in the theater than in Hollywood. I think that Kazan’s enormous talent as a film director and his strong visual sense are often underestimated, but there’s no denying that he was an actor’s director. The actors in Boomerang all turn in powerful, fully realized performances, and I think a lot of that is due to Kazan’s experience directing for the stage. A beloved priest named Father Lambert (Wyrley Birch) is killed by a single .32 caliber bullet fired point blank into the back of his head on Main Street one evening. When a prime suspect does not immediately materialize, the reform party newly in power is lambasted in the press, which leads to overzealous police tactics, which means plenty of round-ups and arrests, but not much else. Finally, a drifter named John Waldron (Arthur Kennedy) is picked up by police in Ohio. Waldron has a .32 revolver in his pocket, was passing through Connecticut at the time of the murder, and is identified by numerous eyewitnesses as the shooter. Waldron also makes a signed confession, but only after he’s subjected to days of intense grilling by police chief Harold F. “Robbie” Robinson (Lee J. Cobb) and Detective Lt. White (Karl Malden), as well as a parade of other police officers and a psychiatrist, Dr. William Rainsford (Dudley Sadler). It seems like an open-and-shut case, and a slam-dunk for State’s Attorney Henry L. Harvey (Dana Andrews), but after talking to Waldron, Harvey has doubts about his guilt, which he shares with his wife, Madge Harvey (Jane Wyatt), before doing some investigating of his own. 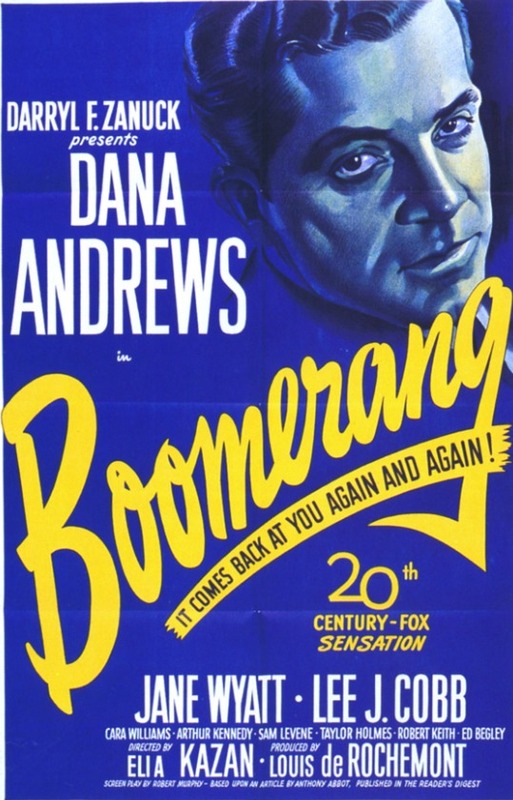 Boomerang brilliantly depicts a number of concepts that were fairly new to the public at the time of its release — the unreliability of eyewitness testimony, especially a large group of eyewitnesses, and the idea that a man who was not guilty of a crime might still make a full confession to police under duress. Kazan also shows exactly what abuse of power looks like. It’s not committed by scheming men of pure evil, it’s committed by police officers like the one played by Lee J. Cobb — decent men with a strong moral code who are desperate to make a conviction, and are absolutely sure that they have the right man. Kazan also does a good job of weaving a story of petty, venal, small-town politics into the larger crime story and courtroom drama. The character Dana Andrews plays is based on Homer Cummings, who would go on to be the U.S. Attorney General under Franklin D. Roosevelt, but it’s not a biopic. It’s also not a wholly nonfictional telling of the real case, since there’s a character created from whole cloth named Jim Crossman (Philip Coolidge), who may or may not have murdered the priest, and who seems to have been created purely to satisfy audience members who need to see some sort of justice done. Luckily, false notes like the Crossman character are few and far between in Boomerang. Posted in 1947, March 1947 and tagged 20th Century-Fox, Alan MacAteer, Anthony Ross, Arthur Kennedy, Barry Kelley, Ben Lackland, Bern Hoffman, Boomerang, Cara Williams, Clay Clement, Dana Andrews, Darryl F. Zanuck, David Buttolph, Docudramas, Drama, Dudley Sadler, E.J. Ballantine, Ed Begley, Edgar Stehli, Elia Kazan, Fred Stewart, Fulton Oursler, George Petrie, Guy Thomajan, Harmon Jones, Harry Kadison, Helen Carew, Helene Hatch, Ida McGuire, James Dobson, Jane Wyatt, Joe Kazan, John Carmody, John Stearns, Karl Malden, Lee J. Cobb, Leona Roberts, Lester Lonergan, Lewis Leverett, Louis de Rochemont, Lucia Backus Seger, Norbert Brodine, Philip Coolidge, Reed Hadley, Richard Garrick, Richard Murphy, Robert Keith, Royal Beal, Sam Levene, Taylor Holmes, Walter Greaza, William Challee, Wyrley Birch. Bookmark the permalink.